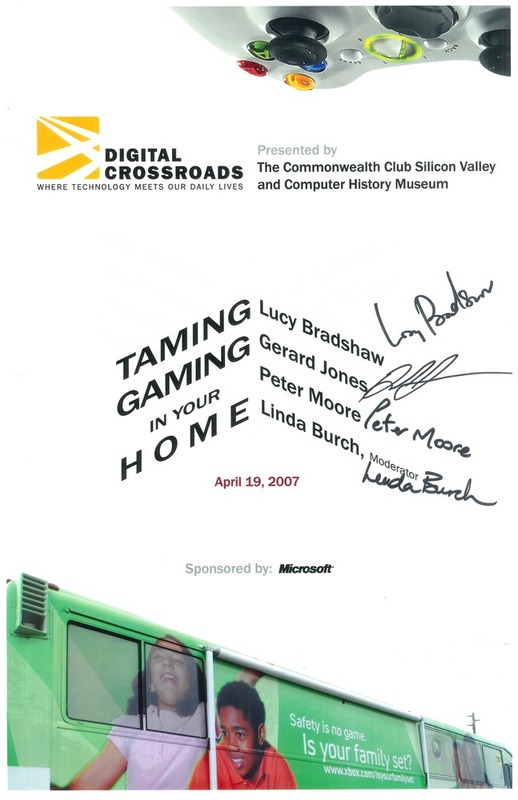 Poster for forum jointly produced by the Computer History Museum and the Commonwealth Club Silicon Valley: "Taming Gaming in Your Home", with Lucy Bradshaw, Gerard Jones, Peter Moore, and Linda Burch, moderator, held on April 19, 2007. Forum is part of the "Digital Crossroads: Where Technology Meets our Daily Lives" series sponsored by Microsoft. Poster has a white background with a color image of an XBox controller at the top and an image of an XBox advertisement painted on the side of a bus saying, "Safety is no game. Is your family set? www.xbox.com/isyourfamilyset". Signed by the forum participants.